WOW! The KING COULD NOT SLEEP AND BECAUSE OF YOU, SOMEONE SENT TO BE A PART OF LIFE, WILL NOT REST TILL THEY HELP YOU THIS YEAR! Someone who told you “NO” yesterday shall say “YES” this year! Today’s Worldwide Fasting General Prayer Points. THIS IS YOUR YEAR OF “YES!” I am excited by HOLY GHOST! Follow me to spy on the DECORATION PARTY OF MORDECAI. VENUE is at the street called “ESTHER AVENUE” CHAPTER 6 VERSE 1: “On that night the king could not sleep, and he commanded to bring the book of records of the chronicles, and they were read before the king.” Did you see that? Hush! Hush! Hush! No Noise yet! We are a spying mission! Listen: NEW HELPERS WILL LOOK FOR YOU THIS YEAR BY FORCE! Sow your DECORATION SEED and DETERMINE to complete this fast! YOUR NAME WILL BE MENTIONED IN AT LEAST 3 PLACES/OFFICES, before KINGS, PRESIDENTS and NOBLE MEN/WOMEN in JESUS NAME! Look up to God and be at the CHANGE-OF-GARMENT DECORATION WORLD ANOINTING NIGHT! It is your own DECORATION NIGHT! Amen and Amen! Pray now! 1. Psalm 136: 1; Thank You Father for keeping me with Your mercy. 2. Psalm 51:1; Father, forgive and have mercy on me again. 3. Psalm 150:2; Father, I praise and worship You LORD with these songs for Your excellent greatness. 4. Matthew 21:19; Father, I command every force programmed to frustrate me and my decoration to whither and perish now by fire and thunder in Jesus name. 6. Lord, let the plans of those planning to take my place of decoration backfire now by fire in Jesus name. 7. Esther 6:1; Father, visit and take the sleep of that man or woman that is holding the key of my decoration in this 2018 now Jesus name. 8. Vs 1; The king must not sleep this year; I must be remembered for good now be fire in Jesus name. 9. Vs 1; The king must not sleep this year; O LORD, take the sleep of that man or woman that must recommend me for this good job this year in Jesus name. 11. The king must not sleep this year; LORD, arise and shake the foundation of my adversaries to pave away for my decoration this year in Jesus name. 12. The king must not sleep this year; O angels of my God, fight my enemies to submission this year in Jesus name. 14. Vs 4; The king must not sleep this year; Father, let every bold, evil scheme of my adversary (Haman) to take my life before my decoration, be overtaken by Your move and command for my decoration this year in Jesus name. 15. Esther 7:9; king must not sleep this year; Father, let my enemies who have plotted to kill me before my decoration party, backfire speedily now in Jesus name. 17. O Haman (enemy) that sat on my seat of honor and decoration collapse and die now by thunder in Jesus name. 19. Opposing powers and personalities resisting my promotion in my career fall now and die by fire and thunder in Jesus name. 20. Opposing household enemies standing against my decoration and celebration, your end has come; now collapse and die speedily by fire and thunder in Jesus name. 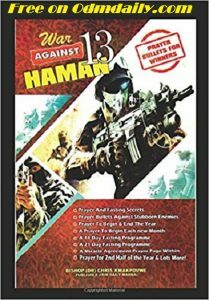 READ War Against Haman 14 DAY 11 AND DAY 12 SATANIC RAGE; BACKFIRE THIS 2019! 21. The king must not sleep this year; O evil judgments form the courts of my enemies, scatter, scatter, scatter now by fire and thunder in Jesus name. 23. Vs 8; You evil decree established be my adversaries to destroy me in order to destroy my decoration party, I command you to scatter, scatter, scatter now by fire and thunder in Jesus name. 24. Vs 13; In the name of Jesus , I scatter every accusation targeted to my decoration party now by fire and thunder in Jesus name. 25. Vs 16; Father, frustrate every command meant to destroy me and my decoration in this 2018 now by Blood of Jesus name. 27. Vs 17; Father, let every stone rolled against my decoration be rolled back now be your angel in Jesus name. 29. Vs 18; The King must not sleep this year until he or she has done what must be done for my decoration to manifest in Jesus name. Next Post:Our Daily Manna For Champions Today 10th July 2018 – WEDDING GOWN ROBBERS: RUN MAD! Amen, we deeply thank God for Bishop, whom God keeps using to bless us. Keep visiting odmdaily.com for a daily dose of Gods word from Bishop. Dont forget to buy your hard copy and also give as a gift to others. I believe in God after reading the scriptures by faith I shall testify before the end of this month in Jesus name. Thanks for your reply. I have not seen exactly what I want. I want daily posting of the prayer points in the ongoing prayer and fasting posting to my inbox. I saw day 2 and day 3. I have not seen from day 4 today. Please help a sister as I don’t want to miss any day of this program. Thanks and God bless you. Kindly Check the Home Page, https://odmdaily.com scroll you will see a lot of resources even daily prayer points for the Fast. Please Kindly Save this Page https://odmdaily.com and keep visiting or call ODM Help Lines and make a complaint. Please teach me on how to pray for the restoration of of my destiny from my enemies. I have remain stagnant for too long this year 2018 is my to take back all that the devil took from me by the blood of Jesus. Amen God bless you. Indeed God has been great to my household through this ministry.More auction upon thee to function to the glory of God i pray.GOD BLESS you sir.